We are committed to having clean, comfortable and safe accommodations for all our animal friends. Our dog and cat lodgings are designed for the unique needs of each. Cats and dogs are housed in separate rooms that are fully heated and air-conditioned for maximum comfort. The air in the facility is exchanged at a high rate to help prevent airborne diseases, and the animal enclosures are inspected three or more times per day and even at night. 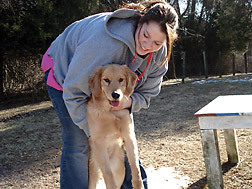 Since the Hermitage is attached to the facility, your pet is never left alone. The Sisters live in close proximity to your pets so they can keep a very close eye on each animal just like you would at home. The premises are protected by a monitored smoke, fire and burglary detection system. The Sisters have a close working relationship with the local veterinary community and can get your pet medical attention any time of the day or night, if ever needed. Dogs – Paws Awhile offers a variety of different dog accommodations to suit your pet’s needs. Each dog has its own sleeping area and exercise area. The sleeping areas may be attached to the exercise area or are separate. We strive to make sure each dog is comfortable and happy, so we lodge the dogs where they seem to be the happiest. Cats – Our cats are housed in separate rooms from the dogs. Each cat has its own box to sleep or hide in. We do NOT accept bedding from home. We provide plenty of soft bedding for both the dogs and cats. Dogs who live together usually board together unless we are instructed otherwise. Dogs from different households are not mixed together unless we are given the permission of both dogs’ families. Paws Awhile offers full day care services for dogs. While you’re at the office, your dog enjoys our attention and love. Day care dogs are provided with playtime, exercise and a treat, but not fed unless you provide a “sack lunch.” Basic Doggie Day Care services are $27.00 per day. Optional activities and services are available. You can call Paws Awhile with your reservation request, or fill out the online request form. Fill in the form and submit it, and we will get back to you as quickly as possible to confirm your reservation or to let you know of any problems with availability. Just click the link below to be taken to the appropriate online request form.